Do toll lanes on Interstate 95, the Capital Beltway and I-66 save drivers time? Usually. Is it worth paying for? That depends, new research suggests. 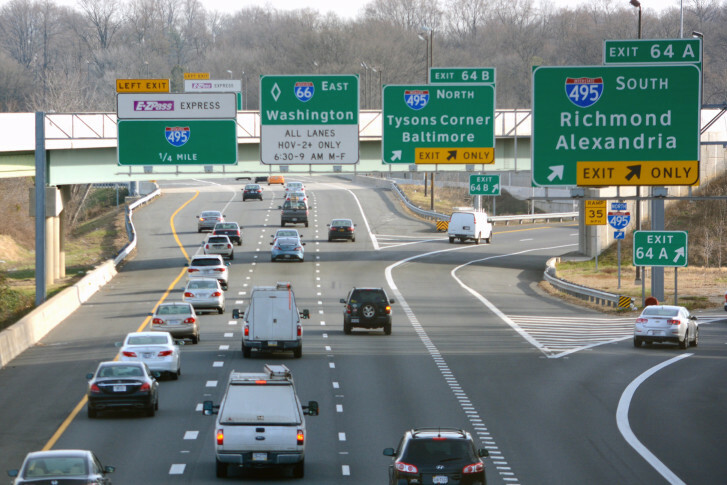 WASHINGTON — Do toll lanes on Interstate 95, the Capital Beltway and I-66 save drivers time? Usually. Is it worth paying for? That depends, new research suggests. The toll rate per mile in the morning is highest by far for solo drivers on Interstate 66, who have no highway-speed alternatives at the height of rush hour. In the afternoon, it’s drivers with fewer than two other people in the car on I-495 or I-95 in Fairfax County who pay the highest rates per mile on average, according to several weeks of data from this spring compiled by researchers at the University of Virginia. Travel time savings in the afternoon are greatest on I-66 compared with U.S. 29 or U.S. 50, and on I-95 southbound from Springfield to the Occoquan River compared to the regular I-95 lanes most days of the week. On Friday afternoon, though, the I-95 Express Lanes south of the Occoquan in Prince William and Stafford counties provide significantly more time savings over the regular free lanes than other days. In the morning, the most significant travel time savings per mile is generally for drivers comparing I-66 with U.S. 29 or U.S. 50, although the time savings to drive the length of the I-495 Express Lanes northbound peaks around 1.5 minutes per mile at 9 a.m. Mondays. “What we’re trying to show is that these parallel routes, 29 and 50, are not truly substitutable routes, because we can see that the travel time savings we’re estimating is quite different on 66,” said assistant professor of civil and environmental engineering Donna Chen. On the Beltway, the toll lanes do not provide significant travel time savings before 6:30 a.m. weekdays when compared with the regular Beltway lanes. On I-95, the Express Lanes save the most time in the mornings Tuesday and Wednesday north of the Occoquan between about 6 a.m. and 7:45 a.m. and very late in Friday morning’s rush, up to one minute or so per mile. The savings appear greater if compared with Route 1. The portion of the I-95 Express Lanes leading north to the Occoquan has the smallest time savings compared with the regular I-95 lanes at most times weekday mornings, but does appear to save around 30 seconds per mile before 7 a.m. Mondays and Tuesdays. The research is based on INRIX traffic speed data, I-66 toll rate data provided by the Virginia Department of Transportation, and data on I-95 and I-495 Express Lane tolls the researchers collected from Transurban’s website covering about three weeks this spring. The data suggest tolls really are rising and falling as more people use the roads, Chen said. “That’s going to prevent more demand on the facility to make sure that it’s capped at a certain demand so that the vehicles can still flow at a reasonable speed, which is what people want,” Chen said. Transurban is the private company that operates and maintains the I-95 and I-495 Express Lanes. Separately, Transurban recently raised the minimum toll in the I-95 Express Lanes from $1 to $1.50 at times the road is quiet. The first base rate increase since the lanes opened at the end of 2014 is intended to cover operations costs. On I-66 inside the Beltway, drivers ride free until 2022 with at least one other person in the car and an E-ZPass Flex switched to HOV mode. On the I-95 and I-495 HOV or toll lanes, drivers need at least two other people in the car and an E-ZPass Flex to ride free. Those same rules will apply when the I-395 HOV lanes are converted to toll lanes late next year, and on new I-66 HOV or toll lanes between the Capital Beltway and Gainesville due to open in 2022. Virginia plans to change the Interstate 66 requirements inside the Beltway at that time to require three or more people in the car for a free ride, syncing up HOT lane rules across the region. Are drivers making logical decisions? The toll paid per mile does not always match up with the time savings provided by the lanes. In part, that could be because drivers cannot always be sure what the comparison between the regular lanes and toll lanes will be for a given trip. Toll lane operators promise a consistent trip, not just a faster one. “Typically, people are getting travel time savings certainly, but the pattern in which they are getting the savings is not as consistent, and that’s because people do not always make logical decisions. Sometimes they will pay to use the tolled lane even if the general purpose lane, which is free, is traveling at the same speed or a comparable speed,” Chen said. Tolls rise and fall based on the amount of traffic in the tolled lanes, including buses, motorcycles and carpools riding free. The toll is not based directly on the amount of traffic on alternative routes. The I-495 Express Lanes appear to provide the most time savings around 8:45 a.m. Mondays, when the toll rate also rises to around $1.75 per mile, and Wednesday evenings around 5:30 p.m. when tolls rise to a similar level. The I-95 Express Lanes provide the most significant benefit for the money through Stafford and Prince William counties before 7 a.m. Monday and Tuesday and between 3 p.m. and 7 p.m. Fridays. Through Fairfax County, the I-95 Express Lanes appear to give the greatest benefit for the cost between 6 a.m. and 7:30 a.m. Wednesday, around 7 a.m. Friday, from 5 p.m. to 6 p.m. Mondays, and from 5:30 p.m. to 6:30 p.m. Tuesdays. Chen was reluctant to give too much specific advice about when the tolls are worth it based on this data. One clear suggestion, though, as long as there are no major unusual problems on I-95 being reported by WTOP Traffic, is to stick with I-95 as opposed to Route 1 if you are driving a significant distance. “I can’t say that it’s always, but generally speaking … that appears to be true. The general trend is that, yes, 95 is faster,” Chen said. She expressed similar caution about the data on Interstate 66 at rush hour. “The general trend still holds true, which is that I-66 is significantly faster than the U.S. 50 and 29 counterparts, but this is over the course of the entire corridor. If you’re not taking 66 all the way from the Beltway to D.C. and you’re only traversing a specific segment within that, your results may vary,” she said. Tolls and traffic do pick up most at rush hour in the middle of the week, with additional delays on I-95 south Friday afternoons. “Generally speaking, I don’t know if people are making logical decisions, but the travel pattern is what we expect,” Chen said. The research was initially compiled to be presented at a conference, so Chen was surprised to see it picked up by Virginia’s Office of the Secretary of Transportation. Deputy Transportation Secretary Nick Donohue highlighted the additional time savings on I-66 during tolling hours, even if that is compared with the other toll lanes that have parallel highway lanes as alternatives. “People are seeing travel time savings that they view to be beneficial as they make that choice to pay those rates to use the facility,” Donohue told Fairfax County supervisors last week. For drivers who do take the entire stretch of I-66 from the Beltway to Rosslyn in the morning, Donohue said, I-66 could be 25 minutes faster than U.S. 50 or U.S. 29.